Now a popular tourist destination, the Queen Saovabha Memorial Institute is a captivating place to visit. Its snake farm is home to thousands upon thousands of deadly snakes. Opened in 1913, the institute extracts venom from these snakes, researches its properties, and attempts to come up with a vaccine and produce antivenom. Visitors can come and ogle at beautiful but deadly snakes such as king cobras and pythons, learning all about the venomous creatures at the same time through lectures and talks that the institute puts on. One of just ten first grade royal temples in Bangkok, Wat Suhat needs to be seen to be believed such is the sheer size and scale of it. Its ornate ordination hall is the largest in the country. Everything about the temple is oversized. Twenty-eight Chinese pagodas line its lower base, with their intricate carvings and decorations perfectly showing off the incredible Thai craftsmanship. Inside is just as beautiful, with wonderful murals depicting the life of the Buddha. The eight-meter high bronze Buddha image Phra Sri Sakayamuni is both an important historical and religious artifact. Lumpinee Boxing Stadium is a great place to head to if you want a fun night out in Bangkok. The passionate fans who come to watch Muay Thai fights make for an intoxicating atmosphere. Run by the Royal Thai Army, the arena holds contests every Tuesday, Friday and Saturday night. Because winning is very prestigious the fights are fiercely contested. The tightly packed seats are close to the ring. Lumpinee is one of the only places where gambling is permitted, so the fans are even more passionate as they have money riding on the fight. With each floor home to a different market street from around the world, visitors to this themed shopping mall can find themselves in Rome one minute before moving on to Istanbul and Tokyo the next. Terminal 21 is really well done; each of the floors is instantly recognizable, with such features as a miniature Golden Gate Bridge and London Underground Carriage transporting you to another world. With lots of restaurants as well as a cinema, Terminal 21 is a fun place to do some shopping in a unique mall. A cavernous place, Siam Paragon is one of the largest shopping malls in the whole of Thailand and there are a wealth of things for people to see and do apart from just shopping. In addition to its endless array of shops and restaurants, the complex is home to an aquarium, an art gallery that showcases Thai art, and an opera concert hall that puts on some dazzling performances. With karaoke, bowling and 15 huge cinema screens also on offer, Siam Paragon is the perfect mix of culture, cuisine, and entertainment all mixed into one. Built during the Ayutthaya Era, Wat Saket is a fascinating place to visit – in large part due to the amazing murals that it contains of what Buddhist heaven and hell look like. 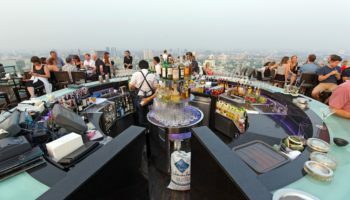 A steep hill – partially made out of a collapsed chedi – is enclosed within the temple compound, and the views of Bangkok from what is now known as the Golden Mountain are delightful. Now a popular attraction, this historic and religious site is well worth checking out when in the capital. The Wat Traimit temple in the Chinatown area is best known for it’s more than 3 meter (10 foot) high golden Buddha image weighing more than five tons. Cast in the Sukhothai style, the image is about 900 years old and was covered in plaster to hide its value. Only in 1957 it was discovered that the statue was pure gold, when the image was moved to a new building and slipped from a crane. The temple itself is said to date from the early 13th century. Dusit Palace is the name of the compound of Royal residences, constructed in European style between 1897 and 1901 for King Rama V.
The most prominent building is the Vimanmek Mansion, built of golden teak wood. The world’s largest wooden mansion, it contains 31 exhibition rooms as well as the throne room, bathrooms and bedrooms. If you visit the Grand Palace before this one make sure you keep your ticket as it gives you free entry into the mansion. 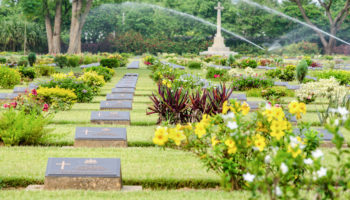 Lumphini Park is more than just an oasis of nature in bustling Bangkok. Originally designed to house Thai crafts and flowers, it is a serene place where people can stroll paths, take a paddle boat ride or just sit and relax and watch others do their morning and evening exercises. Visitors who stroll along the pond may even come across a water monitor lizard, a crocodile-like reptile. Free outdoor concerts take place on Sunday afternoons. 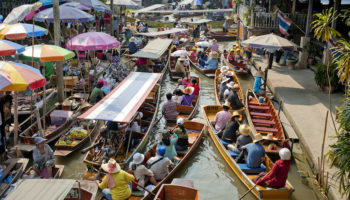 Known locally as JJ Market, Chatuchak Weekend Market is the largest of its kind in Thailand. Some even say it’s the largest weekend market in the world. With more than 8,000 stalls peddling wares ranging from antiques to clothes to furniture, the wildly popular market draws in more than 200,000 people on weekends and includes a wide array of tasty restaurants. Shoppers are also entertained by shows, including dancing and live music. 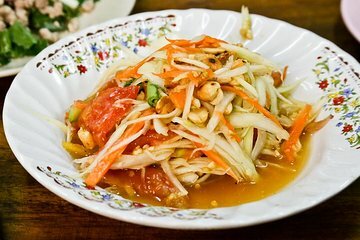 Khao San Road is, technically speaking, a small road located about a block from the Chao Phraya River. Khaosan translates as “milled rice”, a reminder that in former times the street was a major Bangkok rice market. 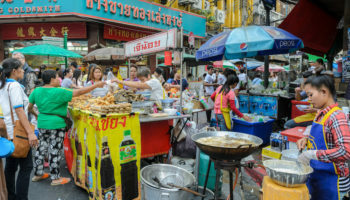 In the last 20 years, however, Khaosan Road has developed into a world famous backpackers hangout. 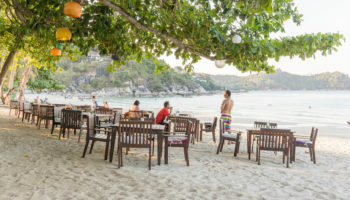 It offers cheap accommodation, ranging from dorm style hostels to reasonably priced 3-star hotels as well as bars, food stalls, restaurants, convenience stores, internet cafes and travel agencies. Opened in 1990, the eight-story CentralWorld marketed itself as a middle class shopping center, opposed to the upper class-marketed Siam Paragon. On 19th May 2010, CentralWorld was one of the many properties set on fire by anti government protestors. The fire raged for two days and the Zen department store collapsed in the fire. After months of repair works, the shopping complex reopened on 28th September with 80% of its retail space open for business. Also known as Wat Phra Kaew, it is famed for a fantastic dark green statue of the Buddha which is made out of jade. The Buddha is believed to date back to the 15th century. 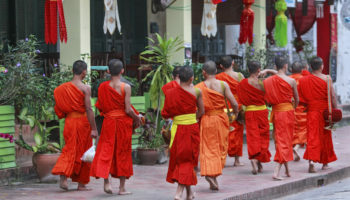 It was moved to various temples around the country for a few centuries, ending up in Bangkok in 1784. Housed in the most elegant and impressive building in the complex, only the Thai king is ever allowed to touch the sacred Buddha. Apart from its famous resident, the architecture of Wat Phra Kaew’s many buildings is beautiful to behold; gold shines forth wherever you look and delightful Buddhist motifs can be seen carved alongside statues of mythological creatures. The infamous CIA operative Jim Thompson revived the Thai silk industry after World War II and had this house assembled from six traditional Thai-style houses. As Thompson was building his silk company, he also became a major collector of Southeast Asian art. Jim Thompson’s House sits on a klong across from Bangkrua, where his weavers were then located. Tourists must take the guided tour through the buildings, which are given in plenty of foreign languages. Located within the Grand Palace, Wat Phra Kaew is the most important Buddhist temple in Thailand. As such, it is a very popular tourist attraction. Situated on the Thonburi side of the Chao Phraya River , Wat Arun (“Temple of Dawn”) is one of the oldest and best known tourist attractions in Bangkok. The temple is an architectural representation of Mount Meru, the center of the universe in Buddhist cosmology. Despite its name, the best views of Wat Arun are in the evening with the sun setting behind it. Wat Pho is famous for the huge Reclining Buddha statue it houses. It is one of the largest temples in Bangkok and also one of the oldest, constructed nearly 200 years before Bangkok became Thailand’s capital. Wat Pho holds the distinction of having both Thailand’s largest reclining Buddha image and the largest number of Buddha images in Thailand. 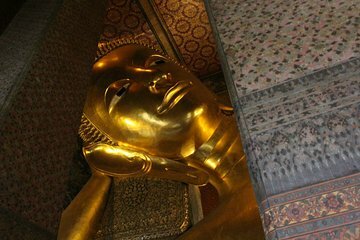 The gold-plated Reclining Buddha statue is 46 meters long and 15 meters high, and commemorates the passing of the Buddha into Nirvana. The construction of the Grand Palace started in 1782 when the capital of Siam was moved from Thonburi to Bangkok. The palace served as the residence of the Kings of Thailand until the mysterious death of King Ananda Mahidol in 1946. His brother King Bhumibol Adulyadej who succeeded him moved permanently to the Chitralada Palace. Today the palace is a major Bangkok tourist attraction. Part of the palace compound is dedicated to a royal temple, Wat Phra Kaew, the most sacred temple of Thailand and home to the famous Emerald Buddha. 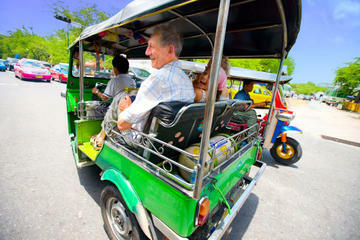 Bangkok is really a nice city with all kind of tourist attractions. 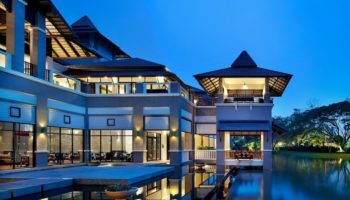 I have been to Bangkok many times before and I am feeling so happy after reading your post because you have written much informative content about major tourist attractions in Bangkok. You just remind my memories of trip to Bangkok. Thanks for the post. Wow what a nice city bangkok. I love very much.